the Building Trade..Members of the Lodge Journeymen Masons, No 8----applied to Grand Lodge for a Charter to erect a new Lodge, under the name of ST JAMES’S OPERATIVE LODGE. The application was favourably entertained, and on 19th August of the same year (1765) a Charter of Constitution was granted. The number of the Lodge on Grand Lodge Roll was originally 124,and the colour red. At the revision of the roll in 1820, the number was fixed at 97, and the colour altered to blue. The Lodge is an offshoot or daughter of the Lodge of Journeymen Masons, No 8, this Lodge being then 58 years old. The Lodge of Journeymen Masons being a daughter of the Lodge of Edinburgh (Marys Chapel) No 1, it will be seen that the Lodge No 8, is the mother, and Lodge No 1 is the Grandmother of No 97. At the foundation of St James’s Operative Lodge a Society for the relief and assistance of their sick and the burial of their dead was instituted. The Society continued in evidence till the year 1835, when it was dissolved. The chief books of the Lodge up to this date have unfortunately gone missing ; they are said to have been destroyed between 1800 and 1804, the years of Dearth. During the Dearth, the Lodge imported grain and supplied the same to its Members at cost price. In theses transactions the funds of the Lodge suffered, as can be gathered from the old books. 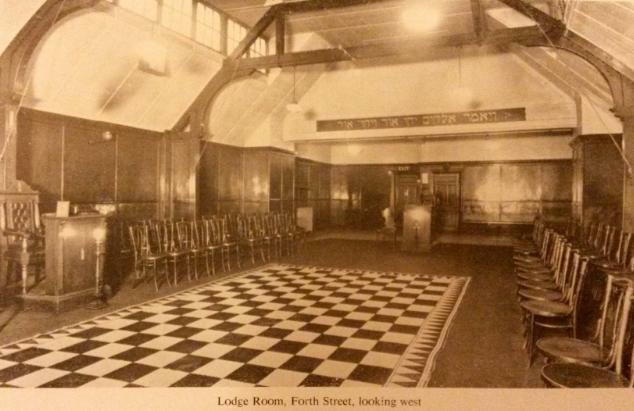 In the year 1812 the Lodge paid over to Grand Lodge the sum of £50,to assist in building(or payment of the debt on (?) ) Grand Lodge. This amount, though taken from the funds of St James’s, was refunded by an assessment of five shillings on each Member, payable quarterly in instalments of one shilling. Previous to the year 1817 , it was customary for the Lodge to hold a Festival on the 1st day of May --- that day being the anniversary of the saint. After the death of Bro. peacock (one of the founders, and the then father, of the Lodge) this festival was discontinued. On the festival day of that year, a timepiece was presented to the Lodge by Bro. Greig, being the work of his own hands. The fees seem to have fluctuated from 1765-1835. In 1797 the fee for Operatives was 40s ; speculative 45s ; the maximum sick money was 5s per week ; funeral money £3. From 1820-1826 the fee of entry was raised from time to time, and the payment to sick augmented to 9s per week; funeral money £5. In 1826 the entry money was raised to £5, including Masonic dues and 5/- extra for every year the candidate was above the age of 25 years of age. In the following year the entry money was reduced to £3. In 1834 the sick allowance was entirely suspended, and on the 26th of March 1835 the sick or funeral society was dissolved, with the concurrence of five-sixths of its members, in terms of laws. 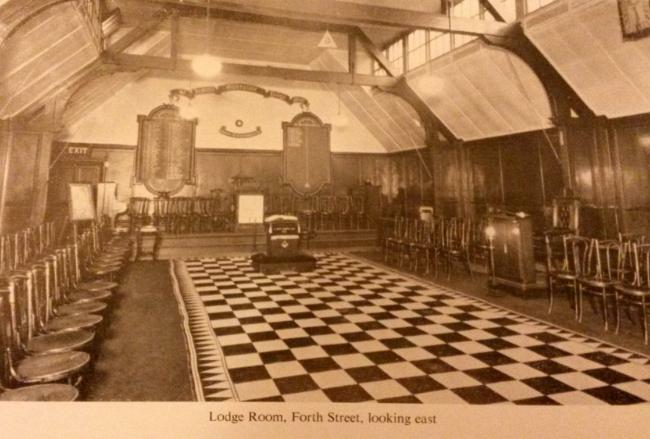 After dissolution the Lodge seems to have lain dormant until 1838 when Bro Ramage was elected R.W. Master. Up until 1840 none but operatives (Masters in connection with the Building Trade) had been elected or could be elected to the chair. That law was recinded in 1840, when Bro John dunn, writer, was elected to the office. On the 25th January 1844 the Lodge, at its annual Festival, was visited by Lord Glenlyon, afterwards sixth Duke of Athole, M.W.G.M and the Members of Grand Lodge. Whether this was the old Lodge room in Writer’s court there is no evidence to show. An ancient oak chest (found in a recess in the steeple of St Giles Cathedral in 1830) was presented by Bro John Watson, along with a piece of the alter of mary of guise the mother of Mary Queen of Scots, From this piece of alter was formed a mallet (last seen in Writer’s court ). The oak chest still in our possession. There is also a portrait of Bro Peacock, painted in 1803 by G. Watson (the first president of the Royal Scottish Academy), and subscribed for the bretheren and presented to the Lodge. “Lodge Edinburgh St James’s Annual Ball in rooms No 1 Hanover street,on 29th February 1856. –The bretheren and their partners assembled about 9 o clock, and marched in grand order round the ball-room to the inspiring strains of the band playing the Masonic Anthem. Dancing then commenced, and was conducted according to programme. During the evening the company was much enlivened by a selection of very fine songs, elegantly sung by several of the ladies, accompanied by the piano-forte, Refreshments , consisting of ices, wines, confections, etc were artistically in a recess of the ball-room, and elegantly served by Bro John Stewart. At 12 o clock all adjourned to an adjoining room, where a very excellent supper was served up by Bro Stewart in a style which could not be surpassed.